Welcome to Gold Medal Swim School! Please take our level assessment below to assist us in placing your child in the most suitable class level. Once you have filled out the pre-registration form for your FREE Trial lesson, a staff member will follow up with you to complete your registration. Please know the swim level assessment helps you get a strong idea of what level your student should be placed in, however, we will do a formal, in-person evaluation during your FREE Trial lesson to help ensure the BEST possible experience for your swimmer. If you have any questions, please call us at (480) 961-SWIM (7946). Do you want to swim with the student? Please rate the student's comfort level in the water on a scale of 1 to 10. Is the student able to independently submerge and swim back to the side of the pool? 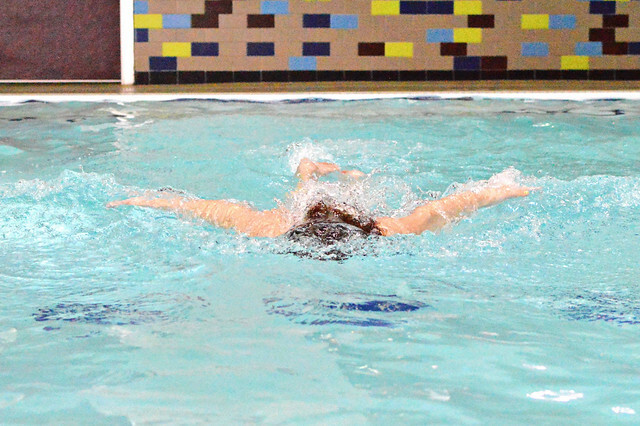 Is the student able to independently jump into the pool, float on their back, and kick to the side of the pool? 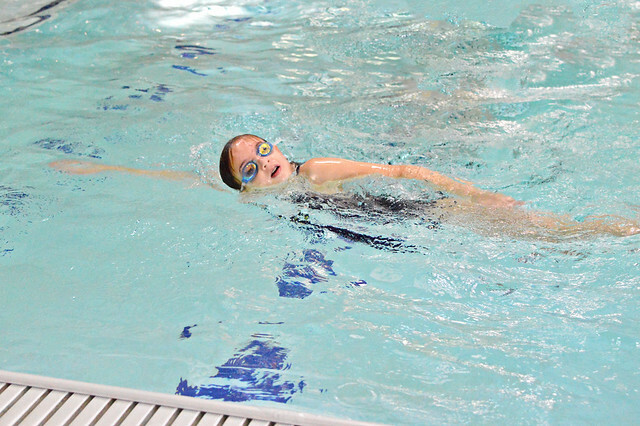 Can the student swim Freestyle and Backstroke? Can the student swim Freestyle with Side-Breathing? Can the student swim Butterfly and Breaststroke? Is the student interested in Swim Team or Adult? Awesome! We recommend Baby Swim! Awesome! We recommend Stingray or Swim Team! Awesome! We recommend Swim Team! Awesome! It looks like your family is already in our system! Let's use this route to avoid creating duplicate accounts. If you have recently been enrolled with us, please call us at (480) 961-7946 (SWIM) to re-enroll in perpetual lessons. If you have recently taken a FREE Trial Lesson and want to enroll in perpetual lessons, please call us at (480) 961-7946 (SWIM). If you are currently enrolled with us and would like to move your booking, please call us at (480) 961-7946 (SWIM). Awesome! Adult lessons are always 60 minutes in length and begin at their scheduled start time. Please bring a swim suit and towel with you. Goggles are optional, if you have some feel free to bring them! After your FREE Trial lesson, be sure to stop by or call the front desk to enroll in lessons! We operate on a perpetual, year-round basis and you'll be able to select a day and time to come each week that works for you. 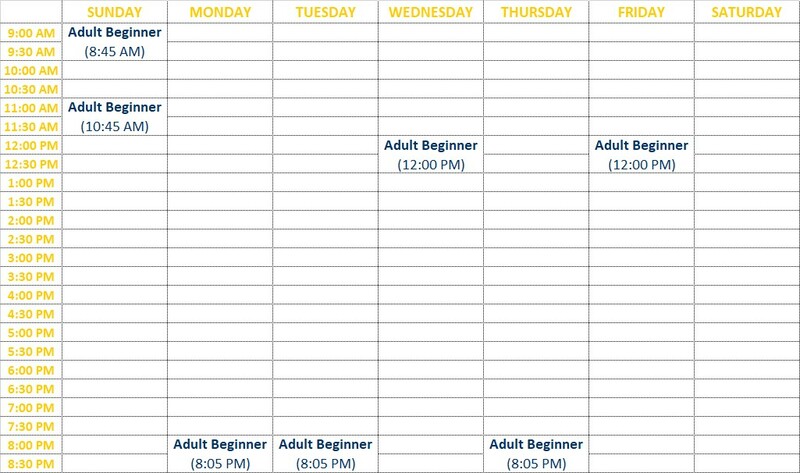 Because we operate on a perpetual system, we can schedule FREE Trial lessons up to one week in advance. Please list your preferences for this week (up to five) and if space is available, we'll reserve your spot in a FREE Trial lesson! Not ready to schedule? Select I'm not sure yet below. Please SelectBaby Swim (3 months - 3 years)Starfish (2 years - 12 years)Seahorse (Starfish graduate)Dolphin (Seahorse graduate)Seal (Dolphin graduate)Stingray (Seal graduate)Swim Team (Stingray graduate)Adult (13 years & older)Boot CampSummer Swim TeamI'm not sure! Awesome! We offer our 30-minute Baby Swim Orientation class every Saturday at 8:30 AM. If space is available and you would like us to, we'll reserve your spot! Parent/caregiver participation is required in all Baby Swim classes (maximum two adults per swimmer). No swimming experience is required for either baby or parent/caregiver. Please bring a swim suit and towel for both yourself and your swimmer when you attend Baby Swim Orientation. We will provide a FREE, REUSABLE swim diaper for your swimmer on your first visit. After your FREE Trial lesson, be sure to stop by the front desk and enroll in lessons! We operate on a perpetual, year-round basis and you'll be able to select a day and time to come each week that works for you. We offer Baby Swim classes every day of the week, except Fridays. Options include weekday mornings, evenings, and weekends. Check back next summer for more Boot Camp! Awesome! Swim Teams will vary days and times depending on which team your swimmer enrolls in. We operate on a perpetual, year-round basis and you'll be able to select a team to come each week that works for you. We'll contact you soon to get you all set up and ready to swim! Check back next summer for more Summer Swim Team! No worries! We'll help you determine the correct level for your swimmer. Regardless of level, please bring a swim suit and towel for your swimmer when you come for their scheduled FREE Trial lesson. Goggles are optional, if you have some feel free to bring them! If your swimmer is under the age of 3, we require they wear a reusable swim diaper while in the pool. We will provide a FREE, reusable swim diaper for your little swimmer on your first visit. After your FREE Trial lesson, be sure to stop by the front desk and enroll in lessons! We operate on a perpetual, year-round basis and you'll be able to select a day and time to come each week that works for you. Because we operate on a perpetual basis, we can schedule FREE Trial lessons up to one week in advance. We'll contact you to help you get all set up and ready to swim! Awesome! Starfish lessons are always 30 minutes in length and begin at their scheduled start time. Please bring a swim suit and towel for your swimmer. Goggles are optional, if you have some feel free to bring them! If your swimmer is under the age of 3, we require they wear a reusable swim diaper while in the pool. We will provide a FREE, reusable swim diaper for your little swimmer on your first visit. After your FREE Trial lesson, be sure to stop by the front desk and enroll in lessons! We operate on a perpetual, year-round basis and you'll be able to select a day and time to come each week that works for you. 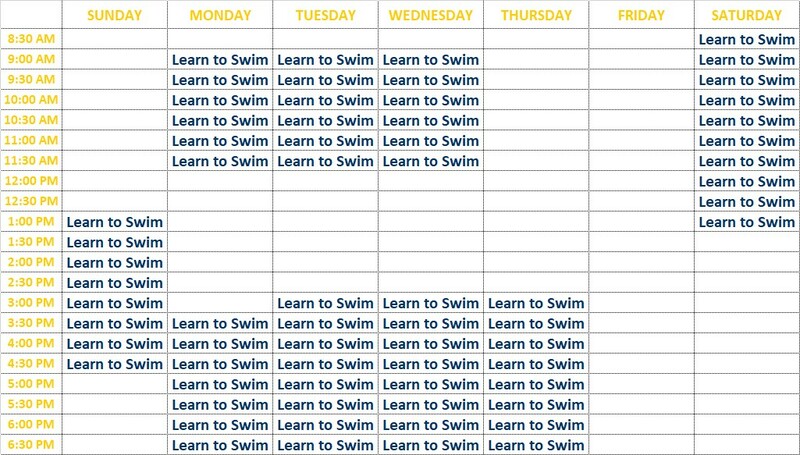 We offer Learn to Swim classes every day of the week, except Fridays. Options include weekday mornings, evenings, and weekends. Because we operate on a perpetual basis, we can schedule FREE Trial lessons up to one week in advance. Please list your preferences for this week (up to five) and if space is available, we'll reserve your spot! Please note, every Learn to Swim level is not necessarily offered during every time shown. Not ready to schedule? Select I'm not sure yet below. Awesome! Learn to Swim lessons are always 30 minutes in length and begin at their scheduled start time. Please bring a swim suit and towel for your swimmer. Goggles are optional, if you have some feel free to bring them! After your FREE Trial lesson, be sure to stop by the front desk and enroll in lessons! We operate on a perpetual, year-round basis and you'll be able to select a day and time to come each week that works for you. 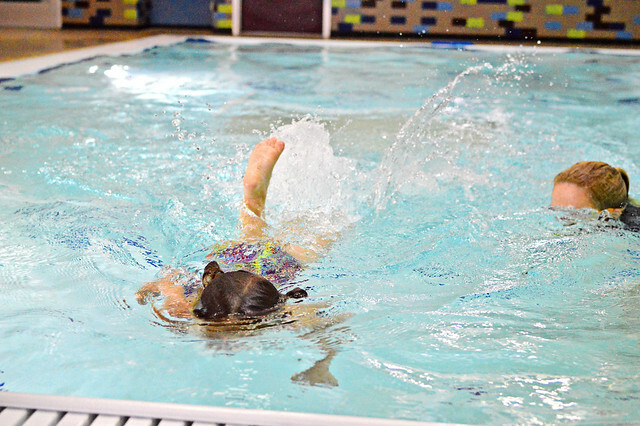 We offer Learn to Swim classes every day of the week, except Fridays. Options include weekday mornings, evenings, and weekends. Because we operate on a perpetual basis, we can schedule FREE Trial lessons up to one week in advance. Please list your preferences for this week (up to five) and if space is available, we'll reserve your spot! Please note, every Learn to Swim level is not necessarily offered during every time shown. Not ready to schedule? Select I'm not sure yet below. Please SelectBaby Swim (3 months -3 years)Starfish (2 years - 12 years)Seahorse (Starfish graduate)Dolphin (Seahorse graduate)Seal (Dolphin graduate)Stingray (Seal graduate)Swim Team (Stingray graduate)Adult (13 years & older)Boot CampSummer Swim TeamI'm not sure! Help us serve you better! Have a question? Go ahead and ask it now! We love to help! If you are registering more than one student, we will try to book their FREE Trial lessons at the same time! If there are no matches at the same time, we will try to book their lessons at proximate times. Let us know above if you prefer different arrangements! Who were you referred by? We'll put a $21.50 credit on their account when you enroll in perpetual lessons! 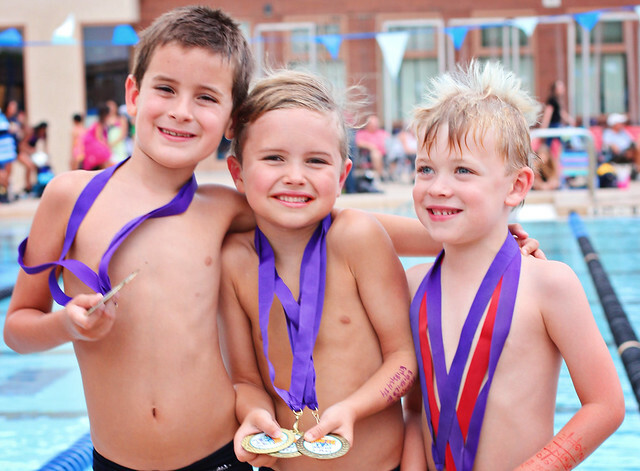 We ask for common courtesy and respect among all clients when at the Gold Medal Swim School.